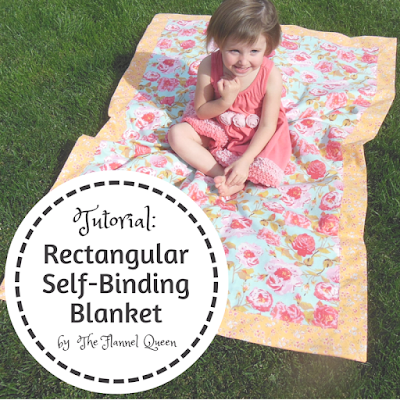 For our blanket tutorial, I decided to tackle the Rectangular Self-Binding Flannel Blanket. This is similar to our tutorial for the traditional Self-Binding Blanket, which is square. But I wanted to test it out to see if it works for a rectangular blanket...and it does! Isn't my little model adorable? She likes to cut her own hair. Two pieces of flannel. Cut them so one piece is 10 inches shorter than the other, both in length and width. For example, if your larger piece is 42" x 62", your smaller piece should be 32" x 52". 1. With pins, mark the middle point of all four sides of both pieces of flannel. 2. Pin the two pieces of flannel right-sides together at the middle points. Now pin the fabrics together, starting at the center points and working out to the corners. Expect extra fabric to be showing at the corners. This is how it's supposed to be! 3. 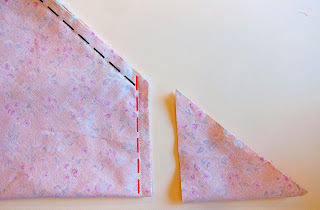 Sew each side: I use 1/2 inch seams when sewing with flannel. Sew each of the 4 sides, stopping 1/4 inch from the corners. 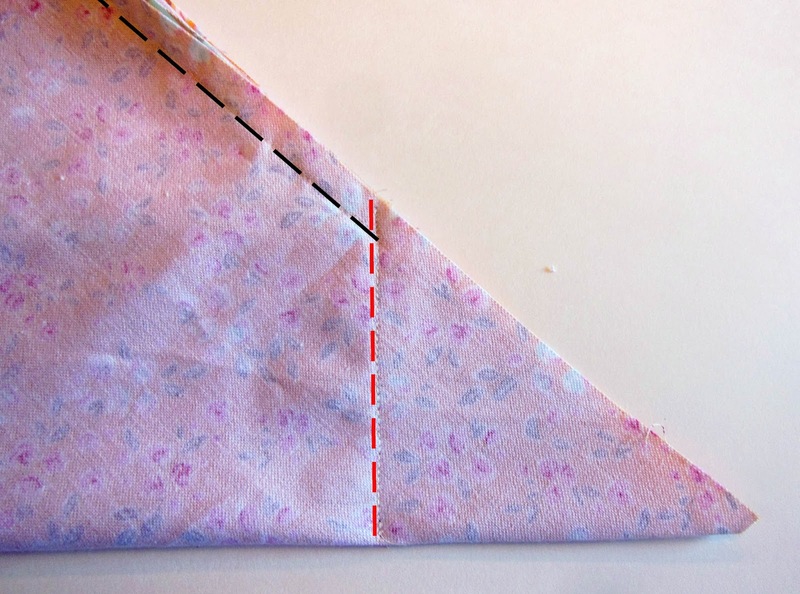 On one of the sides, leave a 6" opening which you will use later on to turn your blanket right-side out. (step 3) This is what your corners will look like. (step 4) The black dotted line is your seam from the previous step. 5. 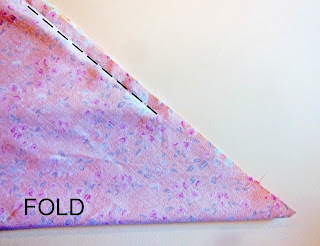 Sew a seam that STARTS at the end-point of the black dotted line and ENDS at the fold, making a 90 degree angle where it hits the fold. Clear as mud, right? The picture will help you out. (step 5) The red dotted line is the seam you sew in step 5. See how it makes a 90-degree angle with the fold? 6. 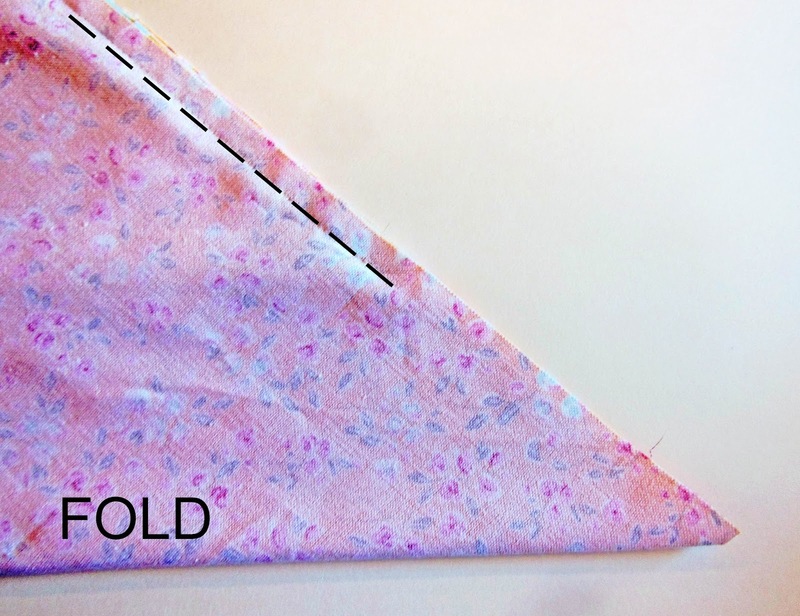 Cut off the triangle to the right of the seam you sewed in step 5. 7. Repeat steps 4-6 for all 4 corners. 8. 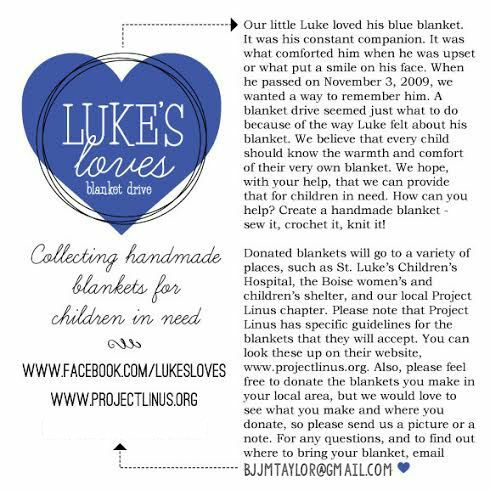 Turn your blanket right-side out. 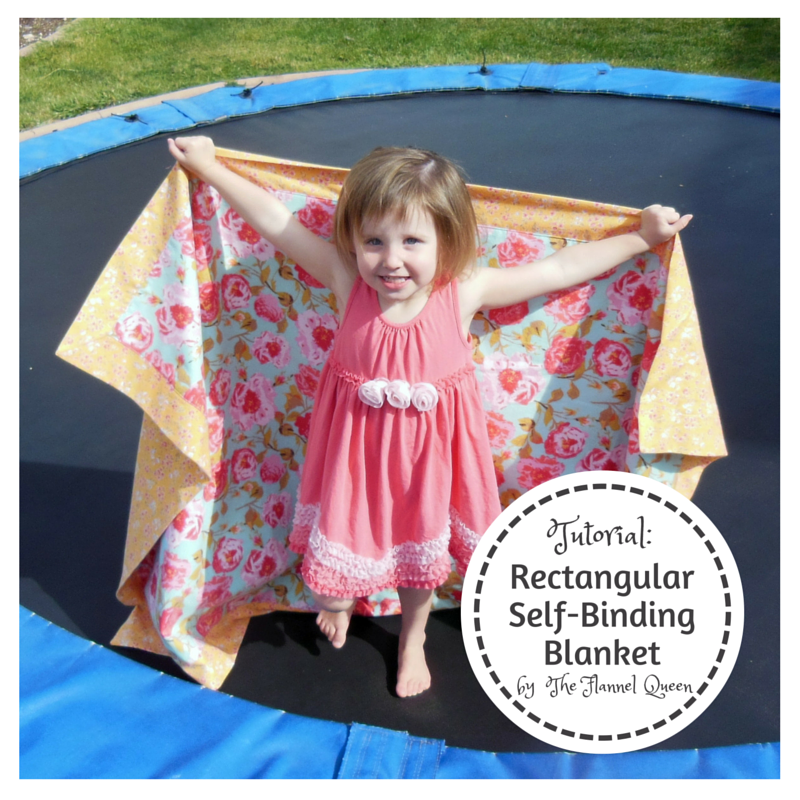 Put your hand inside the blanket and use your fingers to work the corners out so they are nice and pointy. Sometimes they are a little stubborn. 10. Top stitch the rectangle where the two fabrics meet. Be sure to stitch the opening shut. 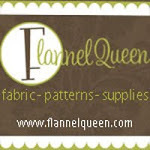 Thank you to Riley Blake Designs for providing the gorgeous flannel from the Chatsworth collection! Adorable! Thanks so much! I love how this turned out! This is an awesome tutorial!!! What a cool way to make a bound blanket, without a bunch of craziness!!! Your directions are fantastic!!! THANKS for sharing... I am going to make afew of these! I found some gorgeous flannel at the beginning of hte season and wasnt sure what I would use it for...now I KNOW!! and what an awesome cause you are donating to, as well...that is really cool!! Does it have to be 10 inches difference in sizes? Will 6 inches work? Yes 6 inches would work. It will make the binding an inch and a half instead of two and a half. 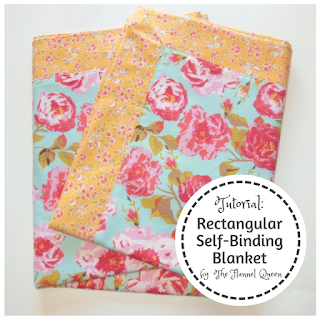 I am new to sewing and trying to understand the math. With 10", which is 5" on each side, and a 1/2" seam sewn, wouldn't that be 4.5" boarder on ea side? I am not understanding how you got down to the 2.5" on ea side. Thank you, in advance for your help! Thank you for the great instructions, I hope it will work with fleece. What is the final measurements of this blanket? Hi! I was wondering, would this work with minky/cuddle fabric? I am thinking it would, just wondering if you had any input or experience with it! Thanks! Do you have a lot to say? Here's your chance! Fleece Hat Scarf Mittens - Easy!